This illustrated fairytale describes the origin of nature through stories told by a variety of birds unique to Australia. Divided into sections by animal, stories are presented in free verse poetry with no set pattern to the rhyme scheme. Intricate drawings by the author decorate nearly every page. 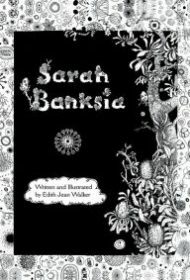 The story begins with a reference to Sarah Banksia, an old “hairy nut lady” who has been sitting in a tree for 200 years. She is referenced repeatedly in the story as still sleeping, with her white hair blowing in the wind. Meanwhile, a parade of animals visits a girl named Margaret to explain the inherent “roundness” of all that is right, good, and important. Although other birds treat Margaret with kindness, an irreverent large black crow tells her she looks more square than round—a reference to the terrible square people who ravaged the land long ago and scared Sarah up into the tree. The animals’ stories about early times always conclude with the message that happiness is round. It’s difficult to discern the audience for this book. While it seems aimed at middle grade readers, the illustrations are more appropriate for those younger. Meanwhile, the words are too difficult and sexual (with references to gonads, testes, etc.) for early readers. Frequent use of Aboriginal words (“theen-who-ween,” “pigga-billa,” etc.) make this a challenging read for those who aren’t Australian, even with the inclusion of a glossary. Additionally, the story feels disjointed, and shifting points of view and punctuation and typographical errors sometimes cause confusion: “‘Its the way they grow./ This is a sad unhappy square/ The Fathers’ the same/ Its from chopping down Trees!’” Finally, although the artwork is imaginative and intricate, it’s sometimes too tiny to be fully appreciated, and varying font sizes (even on opposing pages) give the book a jumbled, disorderly feel. All told, such issues ultimately impede the author’s interesting and ambitious goal of tapping into deep memories of nature’s creatures.